The Mercadien Group congratulates managing director and co-chair of its Forensic & Litigation Support Services Group, Mr. Frank Pina, CPA, CFF, CFE, CGMA, who was bestowed the Distinguished Achievement Award for meritorious service in the detection and deterrence of fraud by the Association of Certified Fraud Examiners’ (ACFE) Board of Regents at the 26th Annual Fraud Training Conference held by the Philadelphia chapter of the ACFE at the Doubletree Hotel on December 3rd. 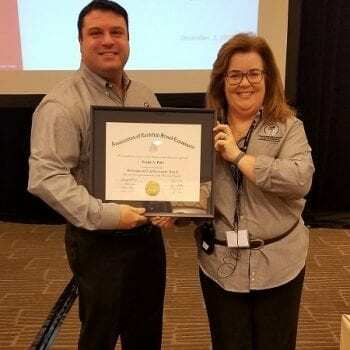 A member of the chapter’s board of directors, chair of its speakers committee, and president-elect for the 2019-2020 term, Mr. Pina was presented with the surprise award before the conference attendees by outgoing chapter president, Ms. Jacquelyn Coyle, CPA, CFE. Certified in financial forensics, a certified fraud and court-appointed examiner, a testifying expert, and a frequent speaker and author on fraud topics, Mr. Pina is highly regarded in the fields of forensic accounting and internal investigations, fraud detection, forensic interviewing, and civil and criminal litigation support. He has broad experience assisting legal counsel and their clients, which range from individuals to multi-national corporations, as well as judicial and government entities, and financial institutions with a variety of forensic engagements. Mr. Pina is a member of the American and Pennsylvania Institutes of Certified Public Accountants (AICPA and PICPA, respectively) and the New Jersey Society of Certified Public Accountants. He is licensed to practice in NJ, PA, and CO. He serves on the PICPA executive, careers and lifestyles committees and received the 2017 Champion CPA and 2015 Young Leaders Awards from the Greater Philadelphia Chapter. He is active in the AICPA Forensic and Valuation Services community, which selected him to receive the Standing Ovation award in 2017. Mr. Pina also serves on the board of directors and chairs the advocacy committee for the Institute of Internal Auditors’ Central NJ chapter, and is a member of the Turnaround Management Association. A lifelong resident of Philadelphia, Mr. Pina is an active volunteer with numerous civic organizations in the city, including Philadelphia VIP, where he serves on the finance committee; the Union League; and YB Connected, a networking organization he co-founded. He earned a BS degree in Business Administration with dual concentrations in Accounting and Marketing from Drexel University, where he was recently appointed Chair of the Accounting Dept. Advisory Board; serves as annual sponsor, program planner, and judge for the FIC3 Fraud & Internal Controls Case Competition each February; and received an Alumni of the Year award in 2017. The Mercadien Group, which Mr. Pina joined in 2012, offers a full spectrum of accounting and advisory services – including traditional audit and financial reporting; federal, multi-state and international tax compliance and planning; compliance oversight, risk assessment, forensic accounting and litigation support services; management and board consulting – as well as technology and wealth management solutions. The firm serves diverse and sophisticated clients, including privately-owned companies of nearly every type and industry, financial institutions, nonprofit organizations, government entities, and high-net-worth individuals and families, providing forward-thinking, relationship-driven financial and strategic services designed to maximize profitability and wealth, minimize taxes and risk, and enhance systems and efficiencies. Learn more at Mercadien.com.